The 1956 Sebring 12-Hour Grand Prix of Endurance was a sign to many in the automotive community that this race had definitely become North America’s premier sports car race and from an international standpoint second only to the 24-Hours of Le Mans. However, events eight months earlier at that same 24 Hours of Le Mans would conspire to cast a dark shadow not only on Sebring but on all racing world-wide in 1956. Two-and-a-half hours into the 1955 Le Mans 24-hour race Pierre Levegh, driving a very fast factory Mercedes-Benz 300 SLR, hit the rear end of the slower moving Austin-Healey 100S of Lance Macklin. Macklin was trying to avoid the leading Jaguar D-type of Mike Hawthorn who had unexpectedly braked right in front of the pits. Macklin swerved to avoid Hawthorn and Levegh hit him when the Healey crossed his path. The Levegh Mercedes became airborne at great speed and struck an earthen embankment across the narrow track that was the only protection for thousands of spectators watching the race. The car struck with tremendous force, killing Levegh outright, and large parts of the car, including the engine, separated from the car flying through a packed group of spectators killing 83 and injuring 120. Today it is considered the most catastrophic accident in the history of motorsports. The United States was not immune to the fallout from the disaster in France and mindful of the spreading public outcry against motor racing the American Automobile Association or “Triple-A” (AAA) decided to withdraw from all participation in racing events. Most Americans know AAA as those friendly folks who show up with a wrecker when their jalopy leaves them stranded on the side of the road. However, from 1902 to 1955 the AAA, through their contest board, was the premier sanctioning body in the United States for such motorsports events as the Indianapolis 500, The Vanderbilt Cup, Sebring 12 Hour GP, stock cars, midgets and sprint cars. Mindful of their public image the AAA was well aware of the hue and cry coming from the public and press following the Le Mans disaster. Fearing an impact on their “bottom line” the AAA elected to abandon its 53 years of involvement in motorsports and thus leave American racing promoters in the lurch. One of those promoters was Sebring founder, Alec Ulmann, and he was in a particularly bad position because in order for his event to receive international recognition he had to find a U.S. sanctioning body for the Sebring race that could be approved by the Federation International de l’Automobile (FIA) headquartered in Paris, France. This approval by the FIA would also give the U.S. sanctioning body the authority to issue FIA racing licenses to American drivers wishing to compete at Sebring. It was very simple; no FIA approved sanctioning body, no international race. When Ulmann got the news about the withdrawal of AAA from racing he knew he had to quickly find such an organization so he contacted Jim Kimberly who was the newly elected president of the Sports Car Club of America (SCCA). Kimberly was the grandson of one of the four founders of the Kimberly-Clark Corporation, the makers of Kleenex. In racing circles he was a wealthy “gentleman racer” and a strong proponent of amateur road racing. Since its creation in 1944 SCCA had a policy of amateurism and non-involvement in professional contests and Kimberly continued this policy by declining to help Ulmann. However, he did announce to the membership in February of 1956 that they could compete in the March 24 Sebring classic, provided they sign agreements not to accept cash prizes. In that way SCCA members could maintain their amateur status. When asked what a SCCA member was to do if he did win a cash prize at Sebring Kimberly suggested that the driver donate the money to the hospital in Le Mans that was still treating the many who were injured in the catastrophic accident the previous June. This was the first time in the history of Sebring that a cash purse was offered. In previous years trophies were the only prizes awarded to winning drivers, now the prize was a share of $10,000. Sebring was now officially a professional racing event. With SCCA out of the picture Ulmann was not about to throw in the towel and cancel Sebring. He called on his wealth of contacts at home and abroad to get “special permission” from the FIA to allow him to process and issue international licenses for the Sebring event as well as approval to run the event through Ulmann’s creation, the Automobile Racing Club of Florida (ARCF). Ulmann appointed himself as president and his good friend, Reggie Smith, as vice president. 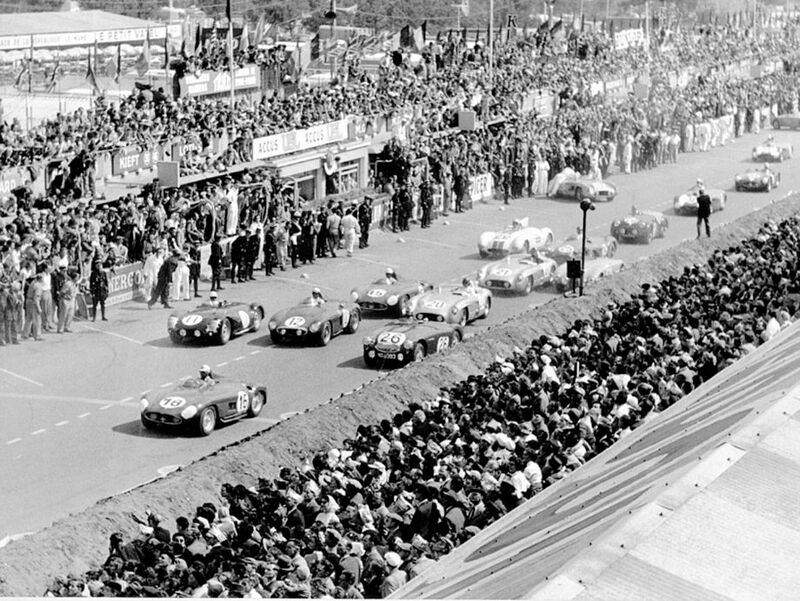 While much of the hullabaloo surrounding the Le Mans tragedy had subsided by January of 1956 those in the international racing business were still contending with the fallout. The Le Mans 24-hour race had been removed from the FIA World Sportscar Championship (WSC) series which was in its fourth year. Le Mans would return to the schedule after the required safety improvements to the track were made. Although it did run as a non-championship event the Targa Florio was removed from the 1956 WSC calendar amid concerns over safety. This would leave only five events for the ’56 season: Buenos Aires, Sebring, the Mille Miglia, Nurburgring and the Swedish Grand Prix. It would be the shortest season in the history of the World Sportscar Championship. Thanks Graham for your comments. Even as late as the 70’s the outer reaches of the Sebring track were sometimes pitch dark. I have actually seen drivers miss turns only having to backtrack searching for the course. Fortunately the wide expanse of airport runways saved the driver from going into the woods and high grass and disappearing until morning. Today both Daytona and Sebring have a lot of lighting making it safer for drivers and course workers who might have to go out on the track. However, memories of those dark and cold March nights on turn 11 watching the lights of cars racing down that mile long North/South runway will always be with me. Andrew: Pass on a link to the story to the folks who are doing the restoration. They might be interested in the photos of the car. Also, I would like to follow the progress of the restoration and so would the fellow who took the photos. Might make an interesting future article for publication. I shall keep you informed as i progress with the restoration. regards andrew bradshaw. I have more information from within the Cunningham team about what happened and it has only needed better photos to be complete, something that now appears to be at hand. Can I please be put in contact with the photographer? I’d like to chat or correspond with him about what he remembers from this event. Thanks. Another excellent article with so much insight, making it a classic piece of historic racing journalism greatly enhanced by an incredible photo spread. Great work Lou, look forward to your next one. Louis, thank you for a very entertaining story filled with fascinating detail and terrific images. As much as is possible with words and pictures decades after the fact, I felt like I was there – fantastic. I have been fortunate to photograph some of these race-cars in contemporary historic racing events but to see and them and hear their stories ‘in-period’ has been a real treat, thank you and keep it coming. Louis: Just FANTASTIC……….everything…photos…comments……..narrative….episodes……just an overall GREAT JOB ! Thanks Louis! What a terrific piece of racing history preserved thanks to you! Your personal insights and perspective on the 1956 combatants brought the race to life. Excellent story coupled with an incredible array of historic photos! Louis, an excellent story, with really great photographs and memories….I’ve taken the liberty of sending copy to Sir Stirling. 1970, Mario’s drive was of course really superb, and the finish of Biblical proportions! In fact, our Gulf Wyer 917K’s were very competitive and led many times, only to be continuously sidelined with problems. windshield. Aeroquip braided steel brake lines. New front hubs (to try and reduce pad “knock-off”). Three hours before the start, Porsche engineer Helmut Flegl approached John Wyer and John Horsman to tell them to change the front hubs back to the old ones, as in a 20 hour 917K test at Weissach, the new front hubs had failed at 18 hours. There was not time to change. 3 (61 laps) hours after the start, our left front hub broke. It took 30 min. to change. At lap 84 the top mounted cooling fan came off and disappeared into the crowd! 4 mins 31 seconds lost! At 10 hours 39 mins our right front upright broke. Thanks Brian. Comments from you are always appreciated and thanks for that bit of history concerning the 917’s at Sebring in 1970. I was there and we were kept on our toes until the last seconds. In my mind it was the best Sebring of all. Thanks for making it so. Another great story from Lou Galanos. I wish I had known about those archives when I did my Portago and Collins books! That is a superb visual account of an important race….evidence that there is still room for a really good Sebring history book Lou!!! Maybe Sebring in the 50s and 60s. That photo of Fangio with the cigarette should be credited to Skip Eveleth I think…he did some great stuff that year. I’m so impressed with the detail…great job. Thank you again for this superb story and beautiful images: Christmas came early this year. I will certainly make sure to share this with all our friends too! All should be able to enjoy this vivid account (another great one, though I remain stuck on your epic rendition of the 65 edition as a personal favorite) of racing history. Cannot wait for your next piece and am already holding my breath. Thank you very much. Great story Louis! Superbly written, with many interesting little nuggets in it. Love the impressive collection of pictures. First Class Louis. Also, thank you to the other commenters who were able to add to it (especially Brian Redman). Thanks for your nice article with superb photos; many of the details behind the scenes are simply fascinating ! What is not well known is that color pictures in those times were a luxury, I understand that most of them were color transparencies (Kodachromes). My late father knew Fangio and he always referred to him as a true gentleman, he also had a very good hand for cars. Chester Flynn worked at GM Venezuela in the early 50´s and sparked interest with local drivers to participate in the 1955 Sebring race; he had good contacts with Alec Ulmann and made arrangements for entering the team: Two Mercedes 300Sl – Chester Flynn- Eduardo Muñoz and Pancho Pepe Croquer-Julio Pola – Eliott Dobbins and a Ferrari that had an accident prior to the race. The 300Sl from Flynn-Muñoz arrived 35 general, the other 300Sl DNF. For the 1956 Sebring race a team from Venezuela was sent to improve the results of the 1955 race. The 1956 team consisted of an Osca MT4 driven by Mauricio Marcotulli and Eduardo Muñoz and a Ferrari 500TR driven by Julio Pola and Enrique Muro. Unfortunately the Osca had a problem with the differential after 15 laps and DNF, and the Ferrari driven by Julio Pola spun into one of the sand embankments and DNF after Julio spent much time trying to dig the car out. The Osca was similar to the car that had won the 1954 Sebring race, driven by Stirling Moss and Bill Lloyd. The Forum is in Spanish, but as one of the co-administrators, we would welcome your comments or any contributions that you want to make. Thanks Doug and thanks to all who have made comments. I will be there at Sebring in March and if you didn’t know already the raceway is going to have a 40th anniversary celebration of the very first IMSA Sebring. That was the 1973 Sebring that was won by Peter Gregg and Hurley Haywood in their Brumos Porsche Carrera RSR. Should be fun seeing some of those old cars that raced that year. 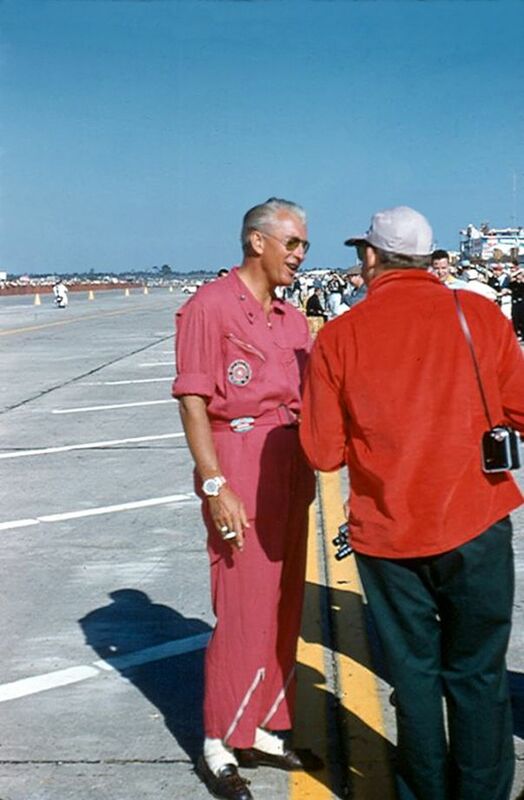 I was assistant Chief Pit Stewart at the 56 Sebring and briefly in charge of the Italian Pits. The J2X Allard that is shown herein belonged to Tex Asche the Chief Pit Stewart. We drove it from Dallas to Sebring and back. With exception of Sterling Moss and me, most every one else has passed on. Terrific article, Friend Jim Kimberly offered to sponsor my 1980 ferrari 512 BBLM # 31589 @ 81 Le Mans.Jim Kimberly and Betty McMahon were to attend race but cancelled at the last minute. Jim was co-Team manager and introduced me to my second X-wife Lin Berlitz Hilton that got pg knowing her only two months. T.I.D.E. pozzi ferrari France, 5th. O.A. IMSA class winner. Last ferrari class winner to finish in top five at Le Mans. Erin Profita, please help save the MIAMI Marine Stadium & old palm beach ! I was at Sebring in 1956. Very nice photos, Louis, bringing fond memories. Sports Car Digest was, and still is, “Top Notch” with excellent race and event coverage, pleasing motorheads everywhere. Thank You. Recently I managed to find a copy in VHS format of this race, done by Alex Xidias, which I had misplaced, and had it saved in digital format. It was uploaded it in You Tube. I really enjoyed getting a great insight into the racing during the ’50s. What a great tribute for Fangio staying with his friend at the hospital; I have always thought of him as one of the great of the greatest drivers and humanitarian. I do enjoy the racing history and comments involving sports cars during the ’30s, ’50s, and ’60s. The period was certainly “The Golden Age of Sports Car Racing”. Thanks for the memories. The gentleman wearing a red polo (image 53), is not A.de Portago.